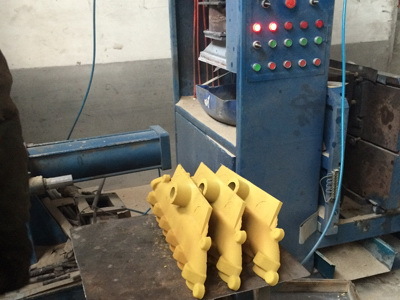 There are many types of casting methods, such as sand casting, die casting, lost foam casting, permanent mold, continuous mold, lost wax investment casting etc., but sand casting process is still the most common casting process. Sand casting process means the main molding material is "sand". According to the different sand materials, it can be divided into green sand, resin sand, and shell molding processes. Herein, we will try to elaborate their difference. Green sand casting uses a kind of humid sand mixed with black clay. This sand is cheap, and can be used repeatedly. So, it is suitable for manual molding, machine molding and automated machine molding. Green sand is the cheapest sand casting process, and is also mostly used casting process in China. The castings made by it will be cheaper than other casting processes. This process is suitable to produce iron castings with unit weight from 0.5kg to 300kg. The size of the castings is better to be smaller than 500mm. In the past, many foundries used hand molding (manual molding), the foundry workers used simple tools to punch the foundry sand to make sand mold tight, however, the casting quality is unstable, and surface quality is not very good. Therefore, this traditional molding method has been replaced by machine molding and automatic molding. 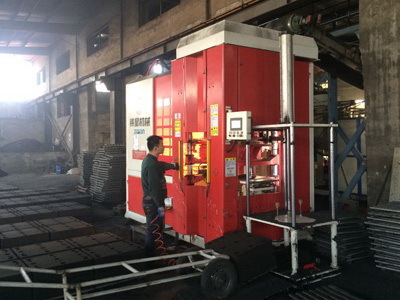 The above photo is showing the molding machine. This machine could make the sand mold tigher than manual method. The above photo is showing the automatic molding. Our Dandong Foundry is using automatic molding. Highly automatic makes the sand mixing, recycle, molding and cleaning quicker and quality better. Resin sand casting process uses furan resin sand as the molding material. 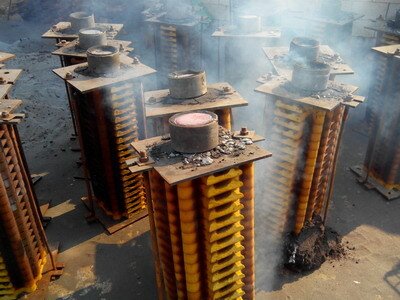 After burning, the resin sand can become hard sand, so it is also called as hard mold casting process. Resin sand can be used repeatedly either, however, it needs to replenish new furan sand constantly. Because the furan resin material is costly, so the resin sand castings become costly. 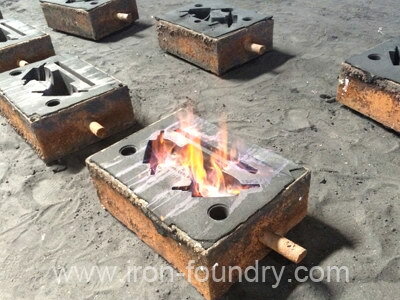 Resin sand casting process is suitable to produce large iron castings with unit weight from 50kg to 2000kg. Therefore, if your casting part is very large, such as longer than 500mm, or very heavy, such as over 50kg, then this casting process may be more suitable than green sand casting process. The above photos are showing the equipments used for resin sand casting process, and also the baking process to make the sand mold to be solid. Shell molding process uses a kind of yellow phenolic resin sand. This sand is more costly than furan resin sand, and phenolic resin sand can not be used repeatedly, so it is one time molding sand. Therefore, this process is more costly than furan resin sand. However, shell molding process can meet higher requirements to the rough casting surface quality, more complex inside structures, and higher casting dimensional tolerances. So, it is widely used for producing small iron castings with high requirements. In China, we normally do not use shell molding process to produce steel castings, however, in other countries, they do. Shell molding process is suitable to produce iron castings smaller than 500mm, and unit weight less than 50kg. It is not suitable to produce too heavy to too large castings. The above photos are showing the machine used for shell molding, and also the molds with hot liquid iron. Normally, the buyers can not, and do not need to choose casting process by themselves, the foundry will choose the suitable one accoridng to the dimensional tolerance, technical requirements and their experience. If you are using our Casting Price Calculator, then you can choose the suitable casting process according to the castings' size and unit weight.